You take extra precautions to protect yourself and your family every time you get behind the wheel. You limit any external distractions and never drive impaired. But what happens when the drivers you share the road with aren’t as responsible? The resulting accident can have devastating results, and if the other driver was driving a commercial truck, this increases the odds of you and the other car passengers suffering life-altering injuries or extensive property damage. The average semi-truck or tractor trailer can weigh more than 80,000 lbs, compared to 4,000 lbs for the average passenger vehicle. Considering the weight and size of these vehicles, it’s no small wonder why even a minor accident could have catastrophic results. You shouldn’t have to shoulder the financial burden of your medical expenses or car repairs on your own – especially if the accident happened as the result of another driver’s negligence. If you’ve been involved in a commercial truck accident in or around Goodyear, Arizona, then an experienced lawyer can help you hold the negligent driver responsible so you can get the compensation you deserve. Who is liable for damages after a trucking accident? Due to the vast size and weight difference between commercial freight trucks, semi-trucks, or tractor trailers, there are both federal and state regulations that professional truck drivers must follow in addition to traditional traffic laws. If they are found to be in violation of any of these laws, then the driver, their company, or their insurance provider may be liable for any resulting damages. While the case is more simple if the accident was caused by defective tires or brakes (the manufacturer would then be found at fault), it’s a bit more difficult to determine fault when it’s based on the negligence of the company or the driver. According to federal law, in most cases, the company that owns the trucking permit is responsible for all accidents, no matter if the driver is an employee or an independent contractor. This means that for your settlement or lawsuit, you’ll be coming up against the company’s insurance company and their corporate attorney, and it’s in their best interests to prove that little or no compensation is warranted for your truck accident settlement or lawsuit. One federal rule that all commercial truck drivers are required to follow is the Hours of Service restrictions. This law states that all truck drivers can only be on the road for a certain about of time before they are legally required to take a break. Due to this, most companies require their drivers to keep a travel log while making their deliveries. They can use this log to note how much time they’ve spent on and off the road. Unfortunately, commercial truck drivers also receive a financial incentive for delivering their cargo as soon as possible. In addition to the added danger of speeding to make a delivery, without taking the federally mandated breaks, the truck driver increases their chances of falling asleep at the wheel or making poor decisions that could result in an accident. For your truck crash settlement or lawsuit, the best decision is to hire a lawyer to thoroughly investigate the circumstances surrounding your accident. A seasoned lawyer has access to professional resources that they can use to determine if the driver was in violation of Hours of Service regulations. In addition to federal law, commercial truck drivers delivering cargo in the state of Arizona are also required to follow all state laws and codes, as well. Arizona law dictates that no large semi-truck, 18-wheeler, or tractor trailer should drive over 65 miles per hour while on the roadway. You may have noticed trucks driving over this speed limit all the time. Many drivers ignore this law and choose instead to match the speed of the surrounding traffic, not keeping in mind that the size and weight of their vehicle poses a great risk to the other passenger cars on the road. If the truck driver involved in your collision was speeding at the time, there are ways that your lawyer can find evidence to support your case. Video camera footage, photos of the accident, and witness statements can all be supporting documents you could use to prove that the truck driver was speeding. In addition to laws regulating the speed limit for truck drivers, Arizona semi-truck law also has regulations that state commercial trucks should be no longer than 28 feet long if there is a single trailer attached. Commercial trucks are allowed to pull two trucks at a time, reaching a maximum length of 57 feet long. If either of these restrictions are violated, then they could be held responsible for any accidents that occur as a result of breaking these laws. As a result of a thorough truck accident investigation, your attorney may be able to discover if the truck driver responsible for your accident was in violation of one or more of these state or federal laws. 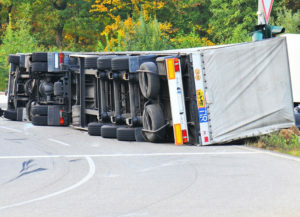 In order to win your truck accident settlement or lawsuit, you must establish a theory of liability. For cases where there is a truck malfunction, then the judge may find the truck’s manufacturer at fault. But in most cases, you’ll need to assert that the truck driver neglected to follow safe driving practices and that led to the unfortunate collision. Negligence can be found on the part of the driver of the company that they’re employed by. The commercial truck company can also be found at fault if they knowingly hire a driver with a history of drug or alcohol abuse problems, or if they failed to inspect the truck when they should have, resulting in faulty lights, brakes, or other important parts of the vehicle. Following a collision with a commercial semi-truck or tractor trailer, the driver’s insurance company will start their investigation very soon in order to build evidence for their case. They’ll claim that you were partially or completely at fault for the accident so that they can pay as little compensation as possible. In order to win the settlement, you’ll need a professional attorney with a full understanding of truck accident law in order to negotiate on your behalf. Nathaniel B. Preston of Warnock MacKinlay Law has years of experience representing victims of car accidents, truck accidents, and surviving family members of a wrongful death in and around Goodyear, Arizona. No matter the circumstances around your case, he can fight for you to ensure you receive the compensation you deserve. The best way for you to win your car accident settlement and receive compensation for any medical expenses, car repairs, or long-term pain and suffering you’ve experienced is to provide your lawyer as much information as possible about the case. Your attorney will head their own investigation into the incident and recreate the accident based on their knowledge of the Goodyear area. They’ll interview witnesses in order to take statements, check the truck driver Hour of Service logs, if available, and review photos or videos of the scene in order to uncover supporting evidence for your claim. In addition to your lawyer’s investigation, there are steps you can take prior to meeting with your attorney in order to help increase your chances of proving liability. By providing your lawyer with images of the accident, they can more easily recreate the circumstances surrounding the collision to determine what played a factor. Depending on the damage done to your car, they may even be able to tell how fast each vehicle was going prior to impact. The first few moments following a car accident can be very disorienting. In those split seconds leading up to or following your crash, you may miss some key factors that could explain why the incident happened in the first place. If you can gather statements from any passersby or other drivers who stopped on the road, then that could be very beneficial to your case, as well. The witnesses may be able to provide information that’s paramount to determining who was at fault for the truck accident. Since they were bystanders, they may have noticed that the truck driver was talking on the phone or driving recklessly. How fast should I agree to a truck accident settlement? Following your accident, it’s understandable to feel like you want the settlement to be over with as quickly as possible to put the entire affair behind you. And the commercial truck driver’s insurance company will definitely agree. In most cases, the insurance company will be in a rush to settle your case – especially if they’re willing to admit their company or the truck driver was at fault for the accident. The driver’s insurance provider will want to reach a conclusion as soon as possible to avoid having to pay for additional medical expenses you may not find out about until later on. To ensure you receive full and fair compensation, your lawyer will let you know about common injuries and medical conditions that you may suffer from following your accident. Their expertise, along with a statement from your medical professional, can be used to ensure you receive payment for any medical treatments you need now and in the future. The majority of truck accident cases are settled by negotiating with the driver’s insurance company to reach a settlement that’s fair. However, the insurance company may become difficult to work with or the driver could refuse to accept fault for the accident. They may even claim that you were partially at fault for the accident in order to justify only paying for a portion of your medical bills or car repairs. In these cases, you may have to file a personal injury, wrongful death, or car accident lawsuit in order to seek the justice you deserve. While your lawyer will be there to represent you for both a settlement and a lawsuit, you’ll want to consult with them ahead of time to determine which path is right for you. In cases where fault is difficult to determine and concrete evidence is hard to come by, then your attorney may suggest bringing your case to court. With a truck accident lawsuit, your attorney will still follow the same procedures of interviewing witnesses, gathering evidence, and collecting the police report in order to build a strong enough case to present to the judge. The main difference is that the ultimate decision for how much compensation is paid is now up to a judge instead of being negotiated between two parties. The results of an accident involving a commercial semi-truck or big rig can be devastating for the passenger drivers involved. If your accident was caused by the negligence of a reckless truck driver, you shouldn’t have to shoulder the financial burden of your medical bills or car repairs on your own. Hold the reckless driver responsible for their actions and get the justice you deserve by reaching out to a truck accident lawyer. Attorney Nathaniel B. Preston of Warnock MacKinlay Law has experience serving residents of Goodyear, Arizona, and the surrounding area win both negotiated settlements and truck accident lawsuits. Find out how he can be of assistance in your truck accident, wrongful death, or personal injury case today when you contact him for a consultation. Our number is 602-652-2009.